The First Single from The Hartman Band's Anthropomorphic Thoughts is NOW available exclusively online!! 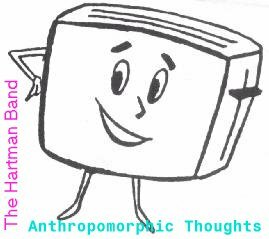 The first single from the Hartman Band's latest album, Anthropomorphic Thoughts, is available for a limited time on the internet. The song is "Big Boy, Dolly & Nugget / Frosted Strawberry Pop Tart" and also features a PREVIOUSLY UNRELEASED B-side, entitled "Mass," which will ONLY be available through this offer. The cost of this single is nothing; it is ABSOLUTELY FREE. The only cost that you may incur is your download time, as the file is approximately 1000K in size. The single is available only as a RealAudio file. You must have RealAudio 3.0 or RealPlayer 4.0 in order to hear the song. Click here to go to the RealAudio page for more information. There are also cassette J-cards available for the single, if you wish to dub the songs to cassette for further enjoyment.